Art filled the void in my heart, and because of that I'm forever grateful. I almost fell indebted to it so I create to compensate for what it's done for me. There’s a new sub-page under ‘Art’ that contains a link to stream the music I’ve remixed and/or made. Working on a page for my insect photography. I should also probably work on some freebies too? P.S. – An update from the Disappearing Frogs Project: The project is expanding to Canada! This leg of the exhibition is entitled ‘Precious Frogs Project,’ so Canadians can check it out in Vancouver starting on September 29, 2017. And if I’m not mistaken, Canadian artists can still submit frog paintings for the cause. Info available here: https://www.preciousfrog.ca/. Idea 3: Cultivating archival perspectives early and often supports individual and community benefits. Keanna introduced Idea 3 best when she wrote that “[b]efore this workshop, creating an archive was something [she] hadn’t even considered. The fact that [she is] young with a smaller body of work than someone further along in their career affected how [she] viewed [her] work, which [she] felt was not ready for archiving. However, the workshop made [her] realize that this is actually a great time to establish and start maintaining one.” The pressing need for a studio archive gained further clarity after returning home to finish a series of paintings for an exhibition. As Keanna approaches the series’ completion, the more her “space for them is dwindling!” Once a critical mass is reached, a lack of archival storage and tracking will actually hinder her workflow, early-career artist or not. The opening reception for Faces was loads of fun! The gallery spaces were open and the artists were crossing their fingers that the evening rains would not stop viewers and potential customers from coming out for Raleigh’s First Friday. Lucky the rain tapered off after an hour or so and gallery spaces were then inundated with art admirers. There was a rather eventful occurrence that sent all of 311 Gallery in a frenzy for a few minutes, but I’d rather not discuss it here because they do not need any more free promotion. 🙂 It was a popular topic of conversation for the evening however, and it led to other discussions about personal perceptions of the world. For this exhibition, I am showing with Margaret Griffin, an interesting lady who has taken a strong liking to Raku sculpting. She explained the whole process to me and I was very intrigued! It’s a lengthy process, but the outcome is simply beautiful. “Can’t Elope (1),” acrylic on canvas. “Can’t Elope (2),” acrylic on canvas. My own pieces created for this show emphasize texture and the surface of natural things. The pairing entitled “Can’t Elope” is 3D-textured. I was freaking out during the creation of those pieces because I was determined to have it resemble the skin of cantaloupe, and it concerned me that it might not come out right (but that’s what the whole creative process is for… right?). So, after finding some white texture medium, I mixed it with acrylic and placed the mixture in a bag. Then I added it in a pattern to the canvas with the same technique as cake piping. The photos to the left are the outcome! Can’t Elope. Haha. I also played a ‘guess what fruit’ game with a lovely couple for this pairing; took them some time and a few hints to figure out what fruit inspired these. I think forcing them to not read the title and putting them on the spot caused them to draw a blank. It would have for myself! “Flyberry” was another painting I was concerned about turning out well. This idea was an expansion of a old sketch. I felt that it fit well with show because there was an actual face for this piece and texture from the strawberry aspect. The biggest challenge for this one was making sure minimal yet detailed in the right places. I like to think it turned out well. This one was a crowd favorite. The other pieces from this show are available for your viewing pleasures on the ‘Art‘ page. 10 pieces were created for Faces. Contact me if you have any interest in a piece. Some have already sold, so bear that in mind. Below are some photos I actually remembered to take of people viewing my work. Enjoy! I am participating in this year’s Through Women’s Eyes, By Women’s Hands art fundraiser with the Compass Center for Women & Families. The Compass Center helps women and families prevent and end domestic violence and become self-sufficient by providing assistance with resources, giving them educational opportunities, and hosting various programs. This is an annual fundraiser that further supports their continuous efforts; this year’s reception will take place on March 4th, 2016. Tickets for the event can be purchased here. Info on the schedule of events is listed here. After finding out about this organization and their mission, I was strongly compelled to support the Compass Center through art for their fundraiser. Being a member of an all women’s cooperative art gallery reinforced this notion. How could I overlook an opportunity to advocate supporting women in these circumstances? In fact, some women in my own family have experienced domestic violence. Hearing of their stories and the learning from the perspectives of their children was eye-opening. I have found that there are misconceptions surrounding this topic and oftentimes people give suggestions without ever having endured anything of the sort. It is an issue that has to be handled appropriately to ensure the safety of the victims. With that said, organizations like the Compass Center will always be an ideal reference point when having discussions on this topic. Because the artwork is to remain anonymous for the exhibition, I will hold off on displaying the pieces I created for this until a later date. However, I will say that my pieces are reflective of surviving, overcoming, and essentially seeing the light through darkness. In a perfect world there would be no victims because there would be no domestic violence, but until then places like the Compass Center are necessary and the work they do will hopefully eradicate it at some point. And I will happily contribute and support the best way I can. UPDATE: Below are a few photos from the event as well as photos of the artwork I contributed for the fundraiser. I chose to paint lotus flowers because they are birthed from mud. “The Corn Victim,” acrylic. 4″ x 4″. When I found out about this project I felt compelled to participate; matters of the environment appeal greatly to me and I have a slight affinity for painting/drawing frogs anyways. The news that frog species were declining across the globe was new to me and also alarming. Having any species’ population decrease significantly is bound to impact our global ecosystem. The 75 percent [of Leopard Frogs] that are chemically castrated are essentially “dead” because of their inability to reproduce in the wild, reports UC Berkeley’s Tyrone B. Hayes, professor of integrative biology. The rest of the article can be read here. I wonder what the population status of Leopard Frogs are today; many articles released about the matter are from several years ago. Hopefully the efforts of biologists and researchers are helping. Hopefully the efforts of artists like myself and those participating in the DFP also help to get the word out about this. If herbicides have the capacity to affect frogs in this way, I can only wonder what kinds of affects they may potentially have on humans and other animal species. It speaks largely to the use of such chemicals in agriculture and poses the question: What should we do better/next to prevent harming more living species on our planet? In North Carolina, there will be chances throughout the first half of this year to get involved on this issue and attend events. Please check out http://www.amphibians.org/disappearingfrogsproject/ for more information! 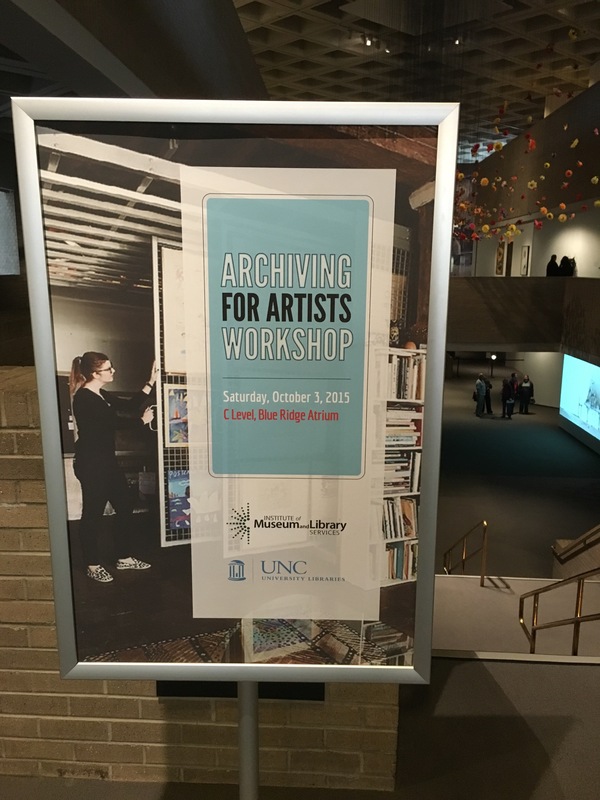 A few weeks ago I attended a workshop focused on archiving for artists. The workshop was super cool; the hosts provided so much information on the many ways to archive artwork. I felt that taking the workshop now versus years down the road would be better because years from now I’ll have a ton more artwork that I need to figure out how to properly store/archive. Coalescence is about a blending of ideas. The work for this show combined nature/figures with geometric shapes. I was inspired to incorporate shapes from this personality test I took while reading a book titled “Why Him? Why Her?” Sappy, I know, but I’m a sucker for romance and couldn’t help but wonder why people choose the lovers that they do (including myself). So anyways, in the book, the author (Helen Fisher) discusses four personality types and their impact on ourselves and who we choose as a mate. My dominant type was ‘Director,’ (although I was neck-and-neck with ‘Negotiator’) and characteristics of that are being adept to understanding the structure of music and having an inkling for geometric shapes. Reading those made me giggle, so I went back through one of my sketch books and stopped when I got to one with a geometric-style background and a figure for a subject. At that moment I knew that I wanted to explore that combination with more artwork. So from there, all of the works for this show were created. Because I was inspired by a book. I do plan to maintain this feature in future works, but who knows what I’ll come across that could sway the outcome of future paintings. I went to Jamnesia, a music festival tucked away in the woods of Hillsborough, NC and had an awesome time. It was really cold that night and my coat wasn’t sufficient enough to stand the ailments, but regardless I had fun. Music, drinks, and a chill atmosphere = a good time. There was this expressions area that was available for anyone to spray paint whatever they wish, so of course I was drawn to it. After making this one I am compelled to create larger-scaled paintings now! If I move forward with this, I will be needing more gallery space for sure, so it’s something to think about. I had the pleasure of participating in Band Together, an annual event that raises money for organizations in support of great causes. As an artist in the Artists’ Village, I had several hours to paint something on canvas for their Silent Auction. I stressed out a bit trying to decide what to paint, to the point I was anxious the whole time I painted it. Although it helped me stay focused and in the zone, my neck and back were killing me the next day; painting with odd body posture for several hours with minimal breaks will do that to you. Keep it simple. Having x amount of hours to do a painting and wanting to put loads of detail in a piece with a lot of aspects to it is way too much! I think I would have been more content with my piece if there was just one subject that had a lot of detail rather than the grande scene I was trying to depict on canvas. Have fun and talk to people. When I’m in the zone and I feel like I’m pressed for time, talking is the last thing I’d want to do. It could have been more fun overall if I’d had the chance to converse with a few people besides answering brief questions and showing my gratitude for compliments. Let go of pressure and expectations. I was surrounded by other artists who had been doing this event for years, and those who had been working artists for even longer. That alone was a bit intimidating to me because I started to feel like I was leagues behind in experience and work quality than them. In turn I ended up feeling like my art wouldn’t be good enough, especially since it’d be surrounded by other works that I thought were amazing. Seriously, the things those artists did in a couple of hours were jaw-dropping. I loved it (and I’m thinking the secret to it was keeping it simple). Back to my point though, there’s no need to compare my work to theirs in ways that make me feel less confident about my own; I take their work as inspiration that in time my work will improve to more of my liking as long as I keep learning and painting. “False Identity,” acrylic on canvas. 18″ x 24″. I reserve rights to all of my creations. If you would like my art for personal or commercial use please contact me for more information.